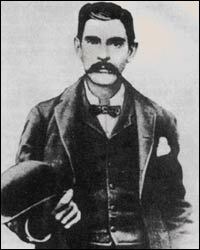 John Henry "Doc" Holliday (August 14, 1851 – November 8, 1887) was an American gambler and gunfighter who is usually remembered for his associations with Wyatt Earp and the Gunfight at the O.K. Corral. He was born in Griffin, Georgia to Henry Burroughs and Alice Jane Holliday. His mother died on Sept. 16, 1866, from tuberculosis. Three months later, his father remarried Rachel Martin. Shortly after the marriage, the family moved to Valdosta, Georgia. In 1870, John Henry began dental school. On March 1, 1872, he received a degree of Doctor of Dental Surgery from the Pennsylvania College of Dental Surgery in Philadelphia. Later that year he opened a dental office with Arthur C. Ford in Atlanta. Not long after beginning his dental practice, he contracted tuberculosis. He was given only a few months to live although it was thought moving to the drier western part of the United States could help to reduce the deterioration of his health. His first stop west was Dallas, Texas. He soon began gambling, and realized this was a more beneficial source of income. After getting into a disagreement and killing a man, Holliday quickly fled to Jacksboro, Texas. In the years that followed, Holliday had many more such disagreements, fueled by a hot temper and an attitude that death by gun or knife was better than that by tuberculosis. He continued travelling throughout the Southwest, during which time he met with Wyatt Earp, the two of them forming an unlikely friendship (Wyatt more even-tempered and controlled, Doc more hot-headed and impulsive). Through that friendship, Doc made his way to Tombstone, Arizona by the summer of 1880, and quickly became embroiled in the local politics and violence that led up to the famous Gunfight at the O.K. Corral. Testimony from some eyewitnesses, as well as historic restagings by forensic scientists, suggest that Doc could have started the gunfight despite Virgil Earp's attempts to calmly disarm the cowboys. Following a hearing that determined the gunfight was not a criminal act on the part of the Earps and Holliday, the situation in Tombstone grew worse when Virgil Earp was ambushed and Morgan Earp killed. The Earps and Holliday fled the town, but in Tuscon Wyatt began his vendetta against the cowboys he believed were responsible for Morgan's death, starting with Frank Stilwell. Doc, along with Wyatt's other friends Sherman McMasters, Turkey Creek Jack Johnson and Texas Jack Vermillion, rode on the vendetta for a few months during which Curly Bill Brocius and Johnny Ringo were killed (Ringo's death is ruled a suicide but Wyatt later claimed Doc Holliday killed him). At some point, Wyatt and Doc get into an argument, and by the end of 1882 they had parted ways. They would meet again in late 1885, in Denver, Colorado, but that would be the last known time they would meet. Doc Holliday retired to the hot springs of Glenwood Springs, Colorado where the sulfur present in the spring stripped his lungs of healthy tissue. In the end, it was tuberculosis that got "Doc" Holliday. Fifteen years after the doctors gave him only months to live, he died peacefully in bed after converting to Catholicism. Dying, his reputed last words were, "This is funny" while looking at his bootless feet. No one ever thought that he would die with his boots off. In an interview in 1896, Wyatt Earp had this to say about Doc Holliday: "Doc was a dentist whom necessity had made a gambler; a gentleman whom disease had made a frontier vagabond; a philosopher whom life had made a caustic wit; a long lean ash-blond fellow nearly dead with consumption, and at the same time the most skillful gambler and the nerviest, speediest, deadliest man with a gun that I ever knew."